Solid and substantial deck framing is truly the heart of a beautiful, well-built deck. After this step, you will have the framework in place for adding deck flooring materials, safety features like balusters and railing, stairs, and even fun items like planter boxes and benches. The framing for this deck runs along the side of a house and is attached to the house on one side of the framework. This low-rise backyard deck remains below 30 inches high, as that is the height that triggers permit requirements in many communities. Additionally, decks below 30 inches high may not be required to have railings and balusters, though many homeowners still do install these features for increased safety. Be sure to check with your local permitting department about the deck building code requirements in your area. A ledger board is a two-by-ten horizontal wood member that attaches directly to the side of the house, taking advantage of the home's strength for one of four sides of the deck framing. House siding cannot hold a ledger board since it is not structural lumber and, in many cases, it is not vertical. Cut out a section of house siding the size of the intended ledger board. Vertically, the ledger board should be located directly on the house's header joist. This is the joist on which the home's interior subfloor and floor covering rest. Position the top of the ledger board so that it is 1 inch below the level of the interior floor to prevent rain and snowmelt from leaking into the house. Mark the section to be cut with a pencil, ensuring that the ledger section is level with a bubble level. Cut the siding with a circular saw set to the thickness of the siding. Finish the cut by lightly tapping the cut lines with a chisel and hammer. Cut the metal flashing to the length of the ledger board. Fit the flashing in the top part of the siding cut-out, so that one side of the flashing is underneath the siding. Fit the ledger board in place and have a partner help you hold it in place. Drill 1/4-inch pilot holes every 2 feet. Counterbore each pilot hole to 1/2-inch with the auger bit. Drive the 3/8-inch by 4-inch lag screws and washers into each pilot hole with the ratchet wrench and sink below the surface of the ledger board. All decks need vertical support posts that hold the deck above the ground. Support posts must be placed on masonry footings that keep the deck firmly rooted in the ground and independent of ground movement and erosion. Choose a distance straight out from the ledger board to place the support posts. Cut the concrete form tubes to length; they must extend far enough down to reach below your area's frost line. Dig the holes for the tubes with a post hole digger, allowing for a couple of inches of rise at the top to elevate the tubes above grade. Attach the metal post bases to the tops of the footings either by embedding a J-bolt into the concrete while it is still soft or by screwing the bases into the hardened concrete with 1/2-inch by 3-inch steel sleeve anchors after the concrete has hardened. Install vertical support posts from the six-by-six lumber, each post cut to length. Determine the length by shooting a laser level line from the bottom of the ledger board, then subtracting 9 1/4 inches to account for the height of the support beam that you will install in the next step. Install the steel column caps to the tops of the support posts with the provided hardware. Situate the caps so that, when the support beam rests in the caps, it will be parallel to the ledger board. Double up two-by-tens to form the support beam. Rest the support beam in the column caps' saddles and attach with galvanized steel bolts, washers, and nuts. The rim joists are the two-by-tens that form the outer perimeter of the deck framing. Cut the two side rim joists (called outside rim joists) so that they extend 1 foot beyond the support beam. Attach the outside rim joists to the ledger board with deck joist hangers. Finally, attach the third rim joist, called the header rim joist, to the two outside rim joists with joist hangers. 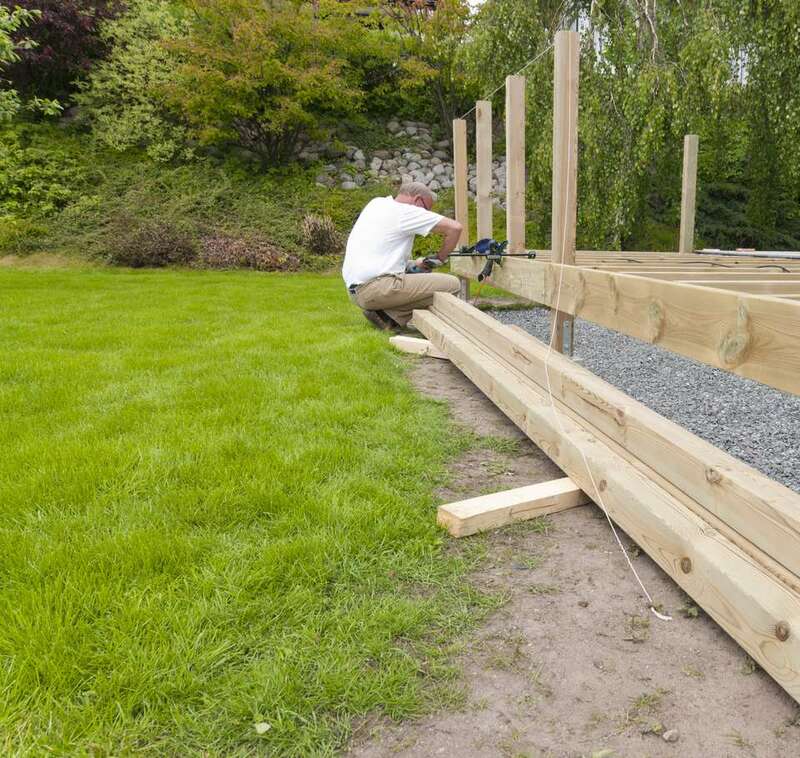 Deck joist spacing is dependent on factors unique to your project such as predicted weight loads and the type of deck flooring that you intend to use. With your pencil, mark each space where the joist will rest on the ledger board. Make corresponding marks on the inside of the header rim joist. Attach the joist hangers with the 1 1/2-inch galvanized steel structural connector screws. Cut the deck joists to length, slide them into the joist hangers, and attach the joists to the hangers with the same 1 1/2-inch screws.